By this point in the Gamera series, things were decidedly being geared more toward children, which is cool, I guess. Kids need monster movies just like the rest of us and these films are good, harmless (well, mostly...) ways to introduce the young ones to the genre. This past holiday weekend I had the pleasure of babysitting my 3 1/2 year old niece, who kept me so busy from 7am until 9pm that I barely had a chance to squeeze in any horror movies. I did however have plenty of time to shop for Minnie Mouse socks, brush up on my watercolor painting, play Dora the Explorer games on the Nick Jr. website and listen to the Yo Gabba Gabba Megamix about 100 times. Side note: I'm praying I can get "Go! Go! Go, Foofa!" out of my head by the end of the week. My niece is usually a pretty good sleeper, but one evening she wandered into the living room while I was watching this. Since it was nearing the end and had been rather G-rated up until that point, I let her watch a couple of scenes before it was back to bed. Her verdict? Gamera is "... a silly and weird turtle." As for Guiron, well: "I don't like him. He's scary and looks mean." If only I could nail a film down in so many words. After astronomer Dr. Shiga (Eiji Funakoshi) holds a press conference about strange magnetic waves they've been receiving, a spaceship lands in a vacant field somewhere in Japan. Young Akio (Nobuhiro Kajima), his kid sister Tomoko (Miyuki Akiyama) and his friend Tom (Chrystopher Murphy) happen to be stargazing with a telescope and see it. None of the adults - including Akio and Tomoko's mother Kuniko (Yuko Hamada) nor neighborhood cop Officer Kondo (Kon Omura) believe them, so the next morning the three kids ride their bikes go to the spot where it landed and sure enough there it is. Akio and Tom go inside and realize no one's on board, so they immediately start pushing buttons. Next thing they know the ship's lifting off and they're flying through space. When they come across some meteors, Gamera the giant jet-propelled flying turtle and "friend of children" saves the day by smashing the rocks, but the spaceship speeds up and they lose him. Meanwhile, Akio and Tom have crash landed on a strange planet called Terra, which is on the opposite side of the sun and has an atmosphere somewhat similar to ours. They first spot the big, winged, aluminum-foil-wrapped bird that looks similar to Gaos, who'd caused some problems in a previous film in this series. Gaos encounters Guiron, who comes crawling out of the ground. Looking like a cross between a shark and a Bowie knife and equipped with throwing stars on his schnoz, Guiron reflects Goas' laser ray back onto him, which cuts off his leg. The two boys then encounter a pair of female aliens in tights, but are Barbella (Hiroki Kai) and Florbella (Reiko Kasahara) as kind as they first appear? Conducting experiments in controlling the environment have backfired for the race of Terrans and now because their planet is frozen and overrun by monsters, they'd like to locate. The two aliens are the last of their race, have lots of neat gadgets and have control over Guiron; who does their bidding. They'd also plan on eating Akio and Tom's brains to acquire their knowledge. A trip to Earth for them will be just another all-you-can eat cannibal buffet. Back on Earth, little Tomoko tries to tell mom what happened, but her constant whining falls on deaf ears. Tom's skeptical mother Elza (Edith Hanson) shows up looking for her son and also doesn't believe Tomoko; telling authorities "Psychologists insist that if you believe everything a child says it's educationally and psychologically wrong!" So let me get this straight... In a world where gigantic alien creatures demolishing cities is the norm, and a big, child-loving turtle with a build in jet propulsion system flies around fighting them, is it really all that hard to believe that a couple of kids flew off in a spaceship? Nevertheless, this is cute and lively if you can get past Akio's obnoxious habit of calling everyone an idiot. Gamera not only gets to fight Guiron several times and eventually save the day, but he also gets to demonstrate his formidable gymnastic abilities on the uneven bar. Some scenes seem a little harsh for really small children, like when the aliens give the boys doughnuts laced with "sleeping powder," then strap Akio down, shave his noggin and then begin to cut into his head with an electric saw! 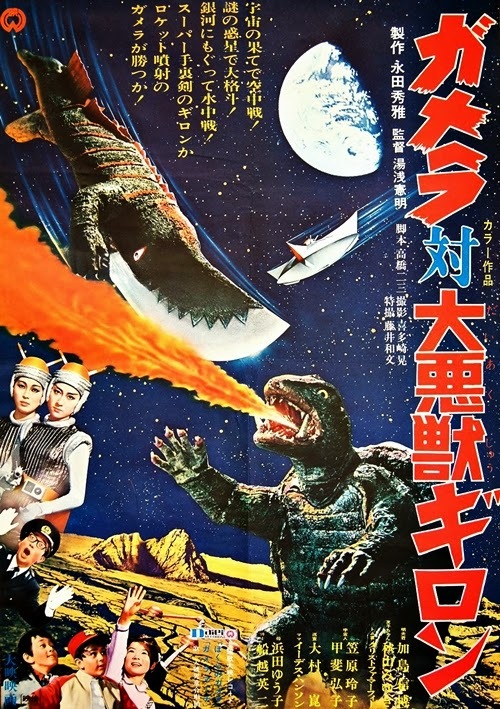 Yuasa also directed the original Gamera, the Giant Monster (1965) and all of the sequels in the original series aside from the first: Gamera vs. Barugon (1966; aka War of the Monsters); which is more serious and adult-oriented. The others are Gamera vs. Gaos (1967; aka Return of the Giant Monsters) and Gamera vs. Viras (1968; aka Destroy All Planets), scenes from both of which are used as flashback footage here, Gamera vs. Monster X (1970) and Gamera vs. Zigra (1971). AIP-TV initially released the films in America, while Sandy Frank handled later U.S. theatrical distribution for most of the series (often having the films re-dubbed a second time). They're all pretty easy to find on DVD, VHS or online to view.